In dieser Woche heißt es beim Global Design Project mal wieder: Case the Designer, und zwar Kylie Bertucci. Folgende Stempelsets von Stampin up sind zum Einsatz gekommen: Gartengrüße, Bannerweise Grüße und Ein Gruß für alle Fälle. War sicher viel Arbeit, aber hat sich gelohnt. Traumhaft schöne Umsetzung! Perfekt! Great idea Kerstin. I love how you've changed up Kylie's colours to create your own special creation. 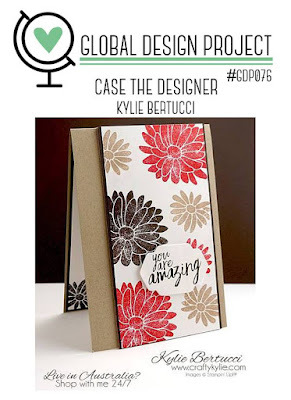 Thanks so much for sharing your talents and joining in with this week's Global Design Project. Eeek! What a fabulous idea! Love how you cut out the flowers and put them on a dark background. It is such a great look! Thanks for sharing! !